With travelling around the world so much easier today than it was for previous generations, it is likely that many bride and grooms will have travel stories throughout their own love story. There is also the fact that many couple shave been inspired by travelling or from far-off destinations. It makes sense for a couple to tap into these influences because they want to create a mood and atmosphere that is about them, and their experiences. This is why the Park Avenue Dot wedding invitation is such a great choice. With Park Avenue being one of the famous, and most expensive, streets in New York, it can instantly trigger memories and happy moments for many couples. 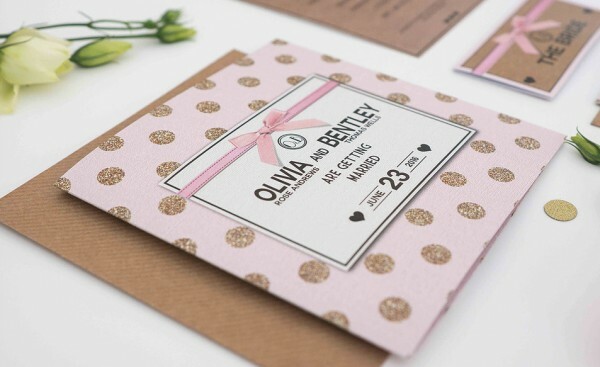 The invitation has a glamorous style, as you would expect from such a major destination, and if you want to create a stylish tone for the special occasion, this is exactly the sort of wedding invitation that you should be thinking of. The colours shimmer with glee and delight in anticipation of the big day, with the baby pink blending well with the golden glitter dots. A perfect finishing touch is provided with a satin bow and any bride and groom that is looking to tap into a glamorous era will find that this invitation is the perfect choice. As the image and identity of the wedding invitation is so striking, it will suit contemporary couples cutting their own stylish path while also being of benefit to couples looking for a touch of long-forgotten drama for their most special occasion. With a range of stationery items for the big day itself and other correspondence, happy couples can be perfectly in tune with the Park Avenue Dot wedding invitation from Hertas Creative Design. Tags: Glitter, New York, Sparkle.